Hong Kong is gearing up for the arrival of virtual banks, or financial institutions without physical branches. The Hong Kong Monetary Authority (HKMA) is set to issue the first batch of virtual bank licenses as early as this year. The HKMA said more than 50 Hong Kong, Chinese mainland and overseas small to medium sized companies (SMEs) and large-scale enterprises have expressed interest in the license. These include homegrown fintech players including WeLab, an online lender, TNG, a mobile wallet specialist, Neat, a banking services provider, and Yedpay!, an online and mobile payments company. Neat launched its personal banking service last year, offering a smart budgeting and savings app with a MasterCard card. It uses facial recognition technology to authenticate customers at log-in and provides a remote account opening service. Earlier this month, Neat raised US$2 million from Singapore-based investor Dymon Asia Ventures and Montreal’s Portag3 Ventures, and launched its business offering. 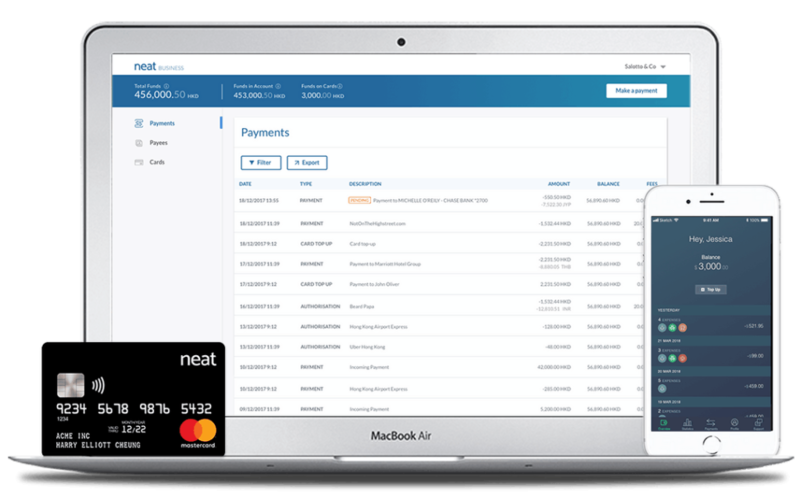 Neat Business offers a multi-user business account, accompanied by MasterCard debit cards, that provides businesses anywhere in the world with a dedicated Hong Kong bank account number. WeLab, a Hong Kong homegrown fintech unicorn, operates several online lending platforms including Wolaidai, one of China’s leading mobile lending platforms, and WeLend, Hong Kong’s largest online lending platform. TNG offers a mobile app that allows users send and receive money across the globe in real time, as well as pay cash in and out at money changers, post offices, pawn shops, shopping mall outlets and retail franchises such as 7-11 stores. A virtual bank license will allow TNG to offer the full range of services, including interest on deposits, lending and investments, that brick-and-mortar banks now offer. Ping An Technology, the tech unit of China’s insurtech giant Ping An Insurance Group, and WeBank, the online banking unit of China’s social media giant Tencent, are also among the potential applicants. Alongside fintech companies, several traditional banks are also looking to get the license including Standard Chartered, and Bank of Asia. These financial and banking giants have recognized the need for greater digitalization and are increasingly offering online banking services. “They understand that these new entrants, the technology companies, they pose a threat to traditional banks,” Sonny Hsu, vice president and senior credit officer in the Financial Institutions Group at Moody’s Investors Service, told CNBC. In May, the HKMA released revised guidelines for virtual banks after consultations with stakeholders including the Hong Kong Association of Banks. “The HKMA welcomes the establishment of virtual banks in Hong Kong,” the financial regulator said. Among the requirements, virtual banks will need to have a physical office in Hong Kong for dealing with the HKMA and customer questions or complaints, a real business plan, in addition to a minimal capital requirement of HK$300 million (US$38 million). They will also be required to marry traditional risk management with technology. “[Virtual banks] will be subject to the same regulations [as traditional banks] so they have to compete on an equal basis as the banks,” said Hsu. According to KPMG, the arrival of virtual banks will provide a boost to the competitiveness of the whole banking sector by providing more affordable and convenient financial services. “Many fintech companies have developed innovative technology that can enhance the overall customer experience, lower the costs of financial products and facilitate the granting of loans to consumers who otherwise do not have the credit history to obtain finance from traditional banks,” the firm said in a report in April. 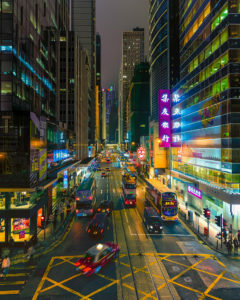 Featured image: Hong Kong Night Market, Publicdomainpictures.net. digital bank Hong Kong Monetary Authority (HKMA) Neat Ping An Technology regulation Standard Chartered TNG virtual bank Virtual banking WeBank welab Yedpay!